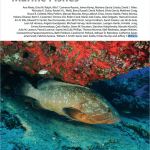 The ecological sustainability of fishing in the deep sea, in areas beyond national jurisdiction (ABNJ), rose to the attention of the member States of the United Nations and elicited action in 2004 and then more strongly in 2006 (Gianni et al., 2011). 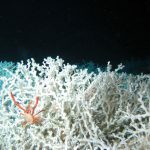 Mounting evidence of the effects of fishing in the deep sea, such as the destruction of deep sea coral communities at sites around the globe, and the slow growth, time to maturity and tremendous age reached by some species of deep sea fish, caused many to consider the sustainability of common fishing practices. 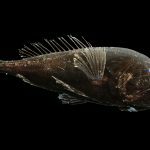 Marine conservation experts call on the European Council of Fisheries Ministers to prohibit fishing for endangered deep-sea species. 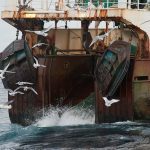 The Council will meet on 14-15 November to decide on Total Allowable Catches (TACs) and quotas for deep-sea fishing in the North-East Atlantic*. A LOT HAS BEEN ACHIEVED IN THE LAST 10 YEARS BUT WE CANNOT GIVE UP UNTIL THE JOB IS DONE. 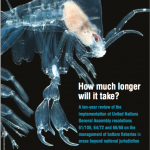 A new report out today, reviewing ten years of international commitment to conserve biodiversity in the deep sea, finds significant improvements in our ability to prevent damage from destructive fishing practices over the last decade, but concludes that implementation of the United Nations General Assembly (UNGA) landmark Resolutions falls short and leaves vast parts of the ocean unprotected from destruction by deep-sea bottom trawling. 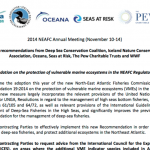 London, November 14, 2014 – The North East Atlantic Fisheries Commission (NEAFC) this week agreed to close six new areas totaling around 11,000 square kilometres to bottom fishing to protect vulnerable deep-sea species ecosystems and extended its prohibition on the catch of several shark species. The 36th Annual Meeting of the Northwest Atlantic Fisheries Organization (NAFO) convenes this week (September 22-26) in Vigo, Spain. Of primary concern to conservation organizations is the protection of deep sea species from bottom trawling. 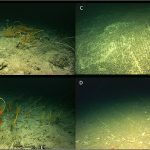 While some areas of the deep-sea in the Northwest Atlantic have been closed to fishing over the past several years, scientific advice presented this year indicates that there is poor protection in several areas including deep sea corals, sponges and seamounts as well as other fragile sea floor species. The expansion of fishing activities into deeper waters1 is unquestionably one of the principal threats to the world’s ocean health2. Most deep-sea fisheries are unsustainable not only for target species but also for non-target fauna and their habitats3. Unless some radical changes in governance and management are being made4, damages to deep-sea ecosystems will soon be irreversible. 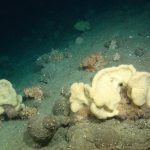 The United Nations have recognized this issue and has urged governments and Regional Fishery Management Organizations to assess the impact of deep-sea fisheries on Vulnerable Marine Ecosystems (VMEs), particularly on cold-water coral ecosystems5. 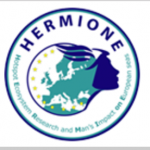 To reach this goal, impact assessments of different types of deep-sea fishing gear and of specific fishery are urgently needed6. London – The 30th annual meeting of the North East Atlantic Fisheries Commission (NEAFC) ended today, with countries agreeing to prohibit fishing for deep-sea sharks but failing to agree on significant, additional measures to safeguard vulnerable deep-sea species and ecosystems. 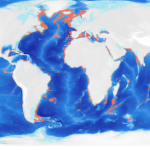 While NEAFC has made considerable progress since 2006 in closing areas on the high seas south of Iceland to bottom fishing, it is has yet to establish effective regulations to ensure sustainable deep-sea fisheries. The workshop to review implementation of United Nations General Assembly resolutions 61/105 and 64/72 has concluded after two days of robust discussion between the representatives of States, Regional Fisheries Management Organizations (RFMOs), non-governmental organizations (NGOs), the deep-sea fishing industry and marine scientists. The workshop led to a greater understanding of the threats to deep-sea ecosystems and challenges to managing deep-sea fisheries. However, it also demonstrated that deep-sea fishing countries and RFMOs have not fully implemented the UN General Assembly resolutions and many deep-sea species and ecosystems on the high seas remain at risk. The UN General Assembly (UNGA) adopted resolution 61/105 in 2006 committing States and regional fisheries management organizations (RFMOs) to implement a series of measures to manage deep-sea fisheries in areas beyond national jurisdiction no later than 31 December 2008, or else not authorize such fishing to proceed. In 2009, resolution 64/72 made the requirements even more explicit. It is now 2011, and a recent review conducted by the Deep Sea Conservation Coalition (DSCC) makes it clear that most high seas fishing States are falling far short of these international commitments.